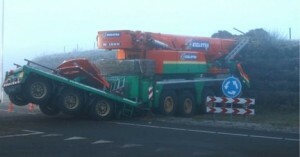 A crane operator died in the Netherlands saturday after his crane ploughed into a roundabout embankment in early morning fog. The five axle 120 tonne crane was towing a three axle counterweight trailer as it drove down the N34 in foggy conditions towards the roundabout under the N33, near Gieten, and carried straight onto the large earth embankment on the centre of the roundabout. The crane’s carrier engine caught fire but was quickly extinguished, it took some time though to reach the driver, as the cab was embedded in the embankment. By the time they did he was dead. The crane, owned by rental company Kielstra, was removed from the embankment later in the day. No one else was involved in this sad incident.